Teaching runs in the Anderson Family. Gene Anderson is a retired assistant principal and adjunct professor. Wife Joyce, whose grandmother was an elementary school teacher, is a retired kindergarten teacher. The second generation of Andersons includes their three children, each of whom became educators. Generation three counts five educators. 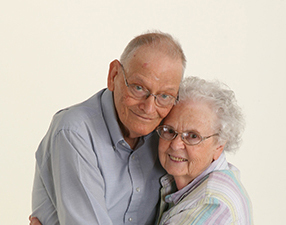 And, for over six decades, the couple and members of their extended family have trusted Meemic for protection. “Meemic is a different kind of company because they understand educators,” said Gene. The Anderson’s partnership with Meemic goes way back. "Gene first purchased Meemic insurance from a fellow teacher," Joyce remembers. The fellow teacher was one of the Meemic Insurance Company’s founders. Over 60 years of policy renewals later, the couple are still members and, like many of our members, have put Meemic to the test. Since the area around Silver Lake is dotted with farms and fresh produce, canning was on Joyce’s yearly to-do list. In the early 70s, son Paul was sent to pick up fruit from a local farm. The soon-to-be MSU freshman took off in the couple’s dark blue four-door Ford Falcon with its snazzy round tail lights and ended up, not with berries, but a crash of the family car. Paul wasn’t hurt, thankfully, but the family needed to file an auto claim. Joyce recalled how quickly the couple’s claim was settled and Meemic got Paul back on the road. A little over 40 years later, Joyce would need Meemic’s help, too. In the Anderson family, Gene has always been the driver. Not so long ago, he decided in favor of the passenger seat and Joyce was charged with selecting the couple’s next car – Joyce’s first car. Joyce loves technology (she’s an Apple whiz and avid Facebook post-er) and her white 2014 Ford C-Max hybrid, with its top-end electronic components, called to her. It took months before it was delivered. Joyce jumped into her car for a trip to the local farm and backed into a post – just one month after its purchase. “For me, a fender bender is nothing, since nobody’s gotten hurt. The car was barely damaged and got fixed right away, but it was eye-opening to me, and a reminder of how much an accident can affect a member. It really was a big deal,” said David. David helped his grandmother file the claim on the phone and found a direct repair facility in nearby Ludington. Joyce had her car back in no time. “Everything was taken care of before vacation even ended. The claims adjusters were very kind and we were highly satisfied with the work done by the repair facility recommended by Meemic,” said Joyce. “Meemic has always been there for us when we needed them," said Gene. While loyalty is important, so are savings. Both Gene and Joyce are native Detroiters. Both have been through the depression, world wars and tight times. Gene remembers his mom taking in boarders – some less pleasant than others. Gene’s credits his success to a simple philosophy, Give 10 percent to God, 10 percent to savings and live on the other 80 percent. You pay cash for your cars, you pay cash for your house and, if you can’t afford something, you don’t buy it. Given the family philosophy, it’s not surprising that the retirees have priced the competition. “We looked around at other companies a while back and couldn't beat the price." Gene said. Like Meemic, Gene and Joyce are strong supporters of educators and education. Gifts they’ve made to the Wayne State University College of Education; Berea College, a liberal arts school in Kentucky that educates low-income Appalachian students; Moody Bible Institute in Chicago (and more) continue to help grow a new generation of educators. And that brings us to generation four of the Anderson clan. Gene and Joyce have 17 great-grandkids (number 18 is on the way). The family history suggests there’s bound to be an educator (or educators!) in the group. If we’re lucky, they’ll be Meemic Members! Join our growing family. Be part of Meemic, the insurance company that’s been a loyal partner to the educational community for over six decades. What are other people saying about Meemic?